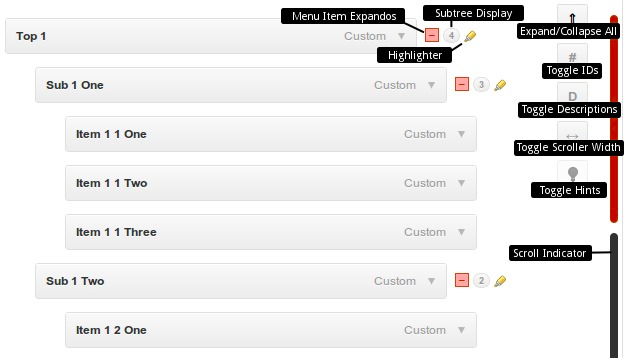 Expand and contract the submenu items in this item’s tree. This display shows the number of children a menu item has at a glance. Hover over it to reveal the total number of descendents (in the tooltip). The highlighter highlights the submenu tree for this item. Hover over it to reveal the highlight. This allows you to see the extent of this item’s tree at a glance. The scroll indicator has a “sausage” section for each top level menu item. Hover over each section to see the name and ID of the menu item to which it corresponds. Click a section to scroll that menu item into view. Shift + Hover over a section to scroll that menu item into view (very useful when dragging menu items over long distances). Display the ID of the LI element for each menu item. These IDs are present on the front-end and are useful for styling. Quickly toggle Descriptions on and off to save space. This is the same as clicking in the Description checkbox in the Screen Options, just more convenient. Toggle Tooltip hints on and off. Hover over a hint to highlight it. Explains everything above in-browser so you don’t really even need this doc. As of version 1.1, the menu enhancer will remember the expand/collapse state of each of your menu items. To reset the states, simply click the Expand/Collapse All ⇑ button once or twice to expand/collapse all items.